Join me this Thursday & Friday for Free Halloween Pet photos! Digital images will be available to share on Facebook. 5×7 printed images are available for a $15 donation to the Food Bank of Larimer County. 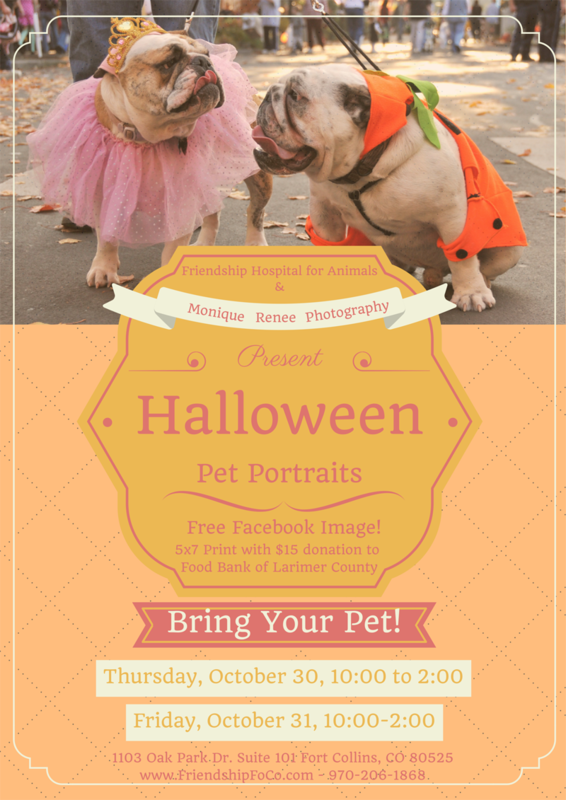 Our non-spooky fall themed photo booth will be at Friendship Hospital for Animals located at 1103 Oak Park Drive just south of Harmony on Lemay. Bring your pet by for a photo (you can be in the photo too!) , a goody bag, and help out the Food Bank of Larimer County. Thursday & Friday, October 30th & 31st from 10:00 to 2:00. Look for the sign for Monique Renee Photography, Silver Paw’s parent company! In my search for businesses to work with in our community Devon’s business intrigued me. Dog massage? Is that a thing? I had to meet her. Between clients and projects we met over lunch in Fort Collins. When I think of massage I think of humans laying face down on a table while the palm of the masseuse firmly kneads knots out of your muscles. Since I have a very elderly dog with painful arthritis I wondered how massage worked. Her answer surprised me, “a light touch”. Devon came to my house with her massage table and set up in the living room. She wrote information in his chart and carefully felt him all over. While lightly assessing him she noted his weight loss, slightly swollen glands, and a lump near his ribs. Our veterinarian has noted all these ailments but Devon’s concern prompted me to email Dr. Smith with an update. Even though Papy is nearly deaf she talked him through each step, comforting him and encouraging him. He did very well and I think secretly liked being “up on the furniture”. She left me with a specific area that I could gently work on at home and assurance that everything is tracked in his chart for future reference. Her work enthralled me so much I forgot to snap even a cell phone image! But, I did have an opportunity for photos a few weeks before Papy’s massage. 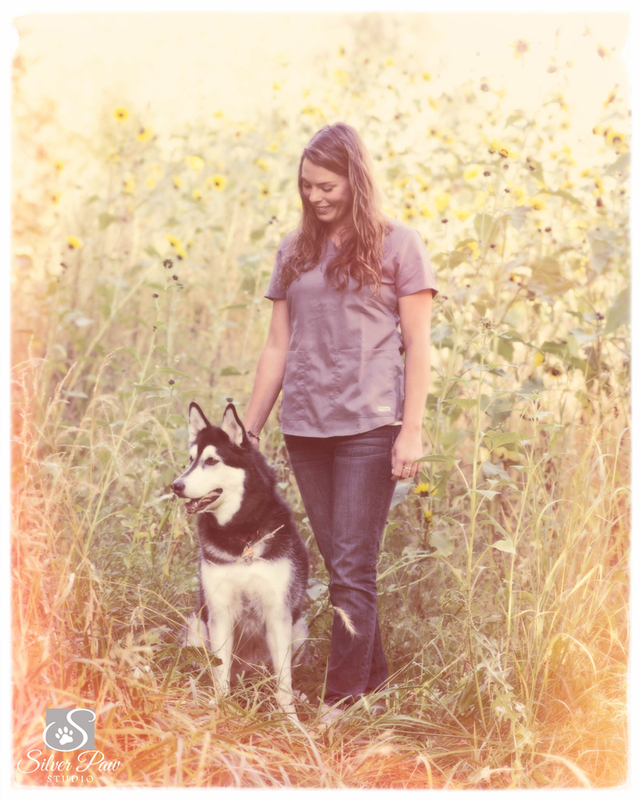 She and Kalia, her Alaskan Malamute, met me at Legacy Park for a photo session. We chose to stay near the river and utilize the bridge, riverside, sunflowers, and the open field. Kalia posed regally for all of her images. Only once did she try to suddenly explore an interesting critter in the field. I always suggest images of the owner / pet parent with their pet. The love Devon has for Kalia shines through in the pictures of the two of them together. In Devon’s words “Only a Mamma and her girl can have this kind of bond.” I especially love the image of Devon’s face framed by Kalia’s ears. 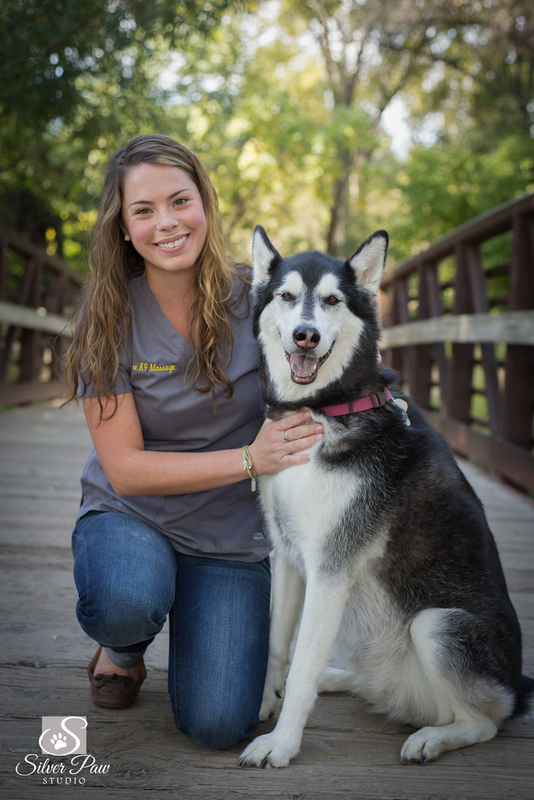 Teaming up with local businesses who are passionate about animals and their work is so rewarding. Devon’s compassion and giving spirit are inspiring; I look forward to working with her and watching her business thrive in the years to come. 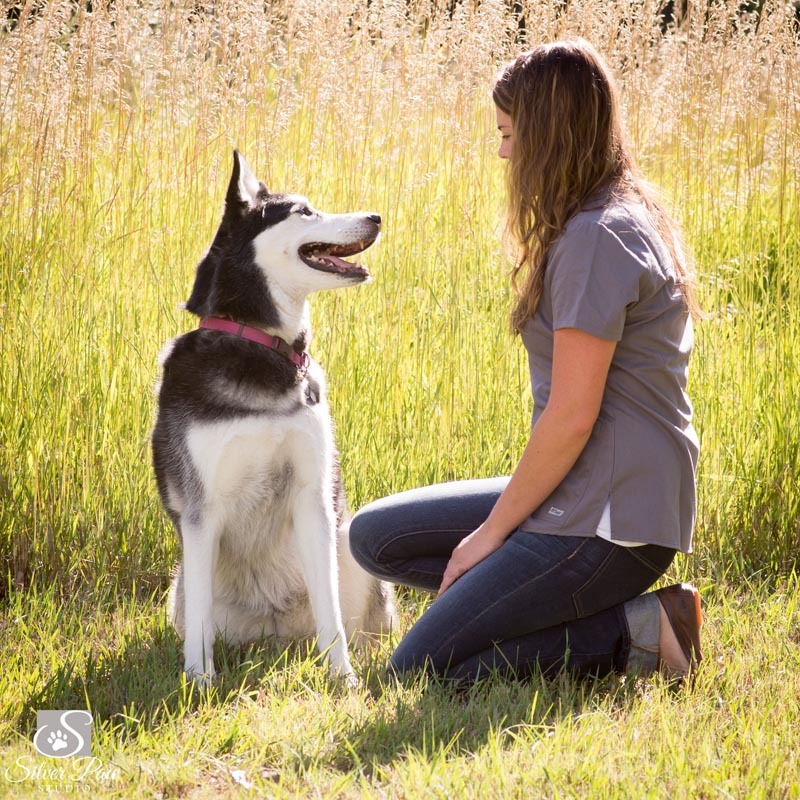 Devon is a certified Canine Massage Therapist through The Lang Institute for Canine Massage and is also a Certified Veterinary Assistant through Front Range Community College. You can reach her at her business Divine K9 Massage.